Soldier beetles are a common outdoor insect that can be abundant accidental invaders as either larvae or adults. Soldier beetles are nicknamed leatherwings because of their soft, clothlike wing covers, which when brightly colored are reminiscent of uniforms. The beetles are elongate, soft-bodied and about 1/2-inch long. Colors vary from yellow to red with brown or black wings or trim. 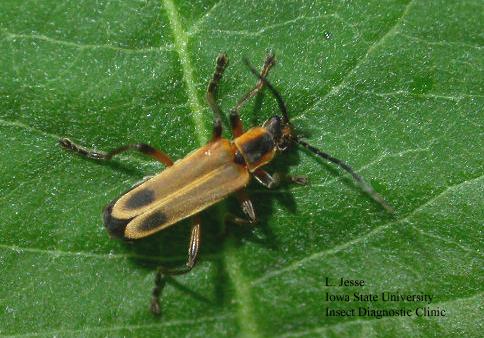 Soldier beetles resemble lightning bugs but do not have light-producing organs. Soldier beetle larvae are long, slender and worm-like. The sides of the body appear rippled or scalloped because of indentations within each body segment. The body is covered with tiny dense bristles and appears velvety. Color is dark brown to gray. The larvae usually spend the winter in damp soil and debris or under loose bark. They are particularly abundant as accidental invaders inside the house in the fall when they are searching for protected locations in which to spend the winter. Both adults and larvae are predacious and feed on other insects. The adults eat caterpillars, aphids, and other soft-bodied insects and can be important predators. As they lie in wait for prey on flowers such as goldenrod they may feed on nectar and pollen but they do no damage to the plants. Since soldier beetles are beneficial and harmless it is unnecessary to control them. Larvae that enter a house in the fall are only a nuisance. Entry can be prevented by weather-stripping, caulking and other measures that seal likely points of entry. Spraying of either the exterior perimeter or the interior has little if any benefit. Soldier beetles already inside the house need only be swept or picked up and discarded.